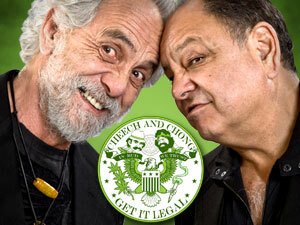 This is your LAST CHANCE to win some cool Cheech and Chong memorabilia. This is the FINAL ROUND of holiday auctions. • Far Out Man VHS - Out-of-print movie which stars Chong's entire family and even has an appearance by Cheech. • It Came From Hollywood VHS - Cheech and Chong, Dan Aykroyd, Gilda Radner and John Candy goof on classic sci-fi movies. • Cheech and Chong (self-titled) LP - This is their first album and helped launch their career. • Cassette Two-Pack - We're offering this special two-pack of cassettes that consists of The Wedding Album and their self-titled first album. • Cassette Two-Pack - We're offering this special two-pack of cassettes that consists of the Up in Smoke soundtrack and Greatest Hit. • Cassette Two-Pack - We're offering this special two-pack of cassettes that consists of Los Cochinos and Big Bambu. Here's what's already up for auction. The auctions below ended 11/22/2000. • Nice Dreams Press Manual - Official Paramount merchandising manual which includes photos, bios and contests. • Los Cochinos LP - Cool-looking, car-shaped LP full of dope. This record features George Harrison on guitar and also won them a Grammy. • Santa Claus and His Old Lady 45 - Just in time for Christmas, this bit features Pedro and Man talking about Santa Claus. We've received tens of thousands of emails asking "When are the movies coming to DVD?". Well, the time has come. Up in Smoke and Still Smokin are being released on DVD November 21st. Born in East LA has also been on DVD for some time now. Preorder now and we'll take 20% off. They make great gifts. Note: The Up in Smoke DVD contains "Additional Release Material."